There is a beautiful side to frugality going on all around us. Women who are coming home are discovering the beautiful life by what I call "creative resourcefulness." Our basic needs are food and clothing, and even at that, we only really need enough to sustain us, not an abundance to indulge in or feel entertained by. - You do not need to have your hair streaked and you don't need to pay for a tanning session. Even if you have your sister, friend or mother do it from a home-kit, that product is not a necessary expense. Instead, do as we did in the old days: if you are blond, rinse your hair in lemon juice and water, and if you are brunette, try vinegar, and go out in the sun and let the sun streak it naturally. Without all this trouble, it will streak in the sun and you will get your tan, especially if you are gardening and trying to grow some vegetables for your family table. -You don't need posts in your skin. This costs money and is a health issue. Ask any dentist or doctor. The people who make money off naive young women who do this, ought to be locked up. Look at the photographs of the women of the 19Th century, shortly after the camera was invented. Without modern makeup, tattoos and skin-piercing posts, they had a fresh bloom in their faces and sweet smiles, highlighted by bright eyes. This kind of beauty is free. While cutting down on expenses, consider learning to cut your family's hair, and learning how to trim your own. You can now get videos and books that show you how. Doing your own hair at home will save you money, and the cost of driving to and from the hair clinics many times. I am not saying that everyone must do this, but if you are seriously trying to redeem your family finances so that you can stay home, this is one expense that is not necessary. Long-haired ladies do not have to have maintenance cuts as often, and can often get a friend to trim their locks. -You don't need fizzy drinks, or coffee by the cup, which can add up to $45.00 a week. You do not need to eat out or buy prepared food. You can make the same things at home, and enjoy it with your own choice of company and music. Home made fries taste much better. The cost of food is considerably less when you only buy raw ingredients that have to be peeled, sliced, or cooked. It costs a lot more to get any kind of prepared food, because you are paying for the extra services of peeling and chopping, putting it into containers with a label, and shipping it somewhere. -Women at home do not need to drink,smoke, gamble, or go to parties. The amount of money spent on these things could buy things of lasting value: a new couch, a new rug, or fresh paint for the house. -You don't need to go to the movies or an expensive vacation. You can improvise and substitute things that are free. You do not need to buy seasons tickets or any tickets to ball games and concerts. They are pleasures but not necessarily needs. There may be nothing wrong with having any of the above-listed items, but if you are cutting down on expenses so that you can secure your position as full-time homemaker, they are not necessary. The Victorian women were entertained by reading, writing, doing puppet shows for their children with socks and handmade dolls, and they knew how to make up stories. In those days it was quite common for families, even those not rich, to have a piano in their house. The young people enjoyed exchanging sheet music and playing new tunes while others gathered around and sang. Even without instruments, families learned to sing in harmony and entertain themselves. The hub of life was the home, and to be invited to someones house for the evening would be a memorable event consisting of happiness and warmth. People used to make up their own jokes and invent their own games. Every family can do this today. The Picket Fence, by Dwayne Warwick from Allposters. You can plan day trips that are interesting vacation locations, and still be in your own bed at night. You can learn to relax at home, even while you are working. You can provide a place in your own back yard to have quiet moments. When your home is cared for and put in order the way you really like it, you won't want to leave it for long, anyway. With all the lovely corners you create in your house, being home will become a lot like a vacation, without the cost. Consider using the cost of a vacation for home improvement: a new stove (or even a new kitchen) new sheets and bedding, and new bath towels and things for your bathroom. -Don't get in the car to go to the store for every little thing. Save up a list and make one trip, or ask your husband to get something on the way home from work. -You, or your children, do not need 40 shirts and 20 pair of shoes. Try to wear out all your clothes and shoes before buying more, and when you buy more, think of ways to get them without spending a lot. If you sew, you do not have to buy expensive buttons or trims. Instead, clip them off the garments you are going to discard, and use them again. The 6-inch ruffle on Lillibeth's dress, was a cotton eyelet curtain valance we had kept in a drawer with laces because we had no use for it but thought it might be useful for some stitchery item some day. She did not have to do any cutting or unpicking or altering; she just sewed it around the hemline of her dress. Our grandmothers kept jars of buttons they clipped off old shirts before using the shirts to crochet into colorful rag-rugs. Sewers can use up their stashes of fabric, and scrapbookers can use up all their papers and embellishments. When you are finished using up available materials in the home, challenge yourself to find a substitute before buying more. When you have a new attitude toward spending, you begin to look at things a little differently: an empty jar, a box, an old piece of furniture--even if broken, can take on new life when you look at it as a valuable raw material. Originally, materials do not come in labelled packages: you can make almost anything you are interested in. Before you go out and buy something, think of how the item came to be made in the first place, and you might possibly be able to make it yourself. I'm not suggesting that you waste a lot of valuable home-keeping time trying to make something like your own leather for shoes, but there are some things you really do not need to buy that can be substituted quite easily. Many women are really good at decorating rich. When they do not have money for lavish furnishings, they manage to take something and make it look like the expensive item they want. It is a matter of style and taste, not money, that makes a home look beautiful, as many people are finding out. When trying to be careful of extra expenses, entertainment and social life can be more enjoyable than ever. Just because you cannot afford to give an expensive dinner, does not mean you have to live in isolation. You can still have company and share some little thing. I used to know someone who would clean her house, bake some muffins, and then call us over for a cup of tea. That is all she had, but oh, did we enjoy sitting at her table and looking at her wonderful setting. Her hand made centerpiece was nothing more than a candle with some cranberries around the edge of it on a plate, but the atmosphere was complete joy. If you do not have flowers, you can always pick something from outside, put it in a vase, and tie with a colorful ribbon. An inexpensive meal prepared carefully and arranged beautifully on the platter is very elegant and hardly distinguishable from something expensive. To live beautifully while being frugal, you can still be a good housekeeper. I have noticed some people who claim to be poor will also have smelly, musty, dirty houses with soil everywhere and the stench of dirty laundry. Children run around in diapers that have not been changed for two days, drinking out of cups that haven't been washed in a week. There is simply no excuse for this, as most poor women are still able-bodied enough to wash a dish. I know of single mothers who have a very low income that still manage to have a very beautiful home and clean children! It does not take money to clean a dish and put things away. It does not take money to have some pride in your existence in the home. If you have no washing machine, some things can be washed by hand, and if you have no water, you can catch rain water with a bucket. People of the past could be poor, for sure, but many of them had a pride about them that required them to be clean, to have a tidy appearance, and to keep their houses neat, and they were resourceful enough to know how to wash their clothes and bathe themselves and their children. Other people who have a sense of dignity, will so live that you can't even guess that they are enduring hard times. Cleanliness and neatness, home cooking, and upright living, will go a long way to making life at home beautiful even if you do not have money to spend. Here are some ideas for using less, so that the products you buy last longer. -You can probably use less detergent. Too much detergent makes it harder to rinse off the clothes, which then can make people have quite itchy skin. -Eat fruit instead of drinking fruit juice. The fruit has a lot more properties in it that are good for you. Buying juice means you are paying someone to squeeze it and bottle it. -Buy fresh vegetables and cut them yourself, and learn to cook them so that they taste good, instead of buying frozen. If your electricity, for any reason, gets knocked out, the frozen things will spoil anyway. Cooking with fresh ingredients is like gourmet cooking, which is what a lot of the popular television shows feature. You can do this at home and experience the satisfaction of eating something that is very good for you in an atmosphere that is better than a fine restaurant. -Read the ingredients on packages of your favorite foods and figure out how to make them yourself. Often a flavoring is only garlic and salt. Italian season consists of oregano, basil and a few other ingredients, all which you can use yourself to make your favorite salad dressing or sauce. Just about everything you buy can be made by using basic ingredients at home. -Get out your stack of magazines that you have saved from years gone by. Pick the current month and display them on one of the tables. Read them when you need to sit down and rest. They are very refreshing! Sometimes when I tell people that I do that with old issues of Country Woman or Romantic Homes, they "feel sorry" for me, but now, I do not do it because of poverty. I enjoy it! I see things in a different way when I have not seen them for a year. It is like taking out a box of old letters and reading them again. After all, many magazines cost as much as a book these days. Why not get them out and make use of them, even if it is for clip art for scrapbooks. -Consider growing a garden. It does not have to be an ordeal. Just put some seeds in some soil and water them. I knew of one woman who was not in good health one year, so she just pulled up some weeds and grass, and put seeds in the loose soil and covered them up. Her children watered them, and she had a harvest. She did not have a tiller or a shovel, but she still grew some tomatoes and cucumbers. If you only have a tomato plant, your yield will be good enough to save you some money at the grocery store. During the World Wars, Americans and British had "Victory Gardens." Each family was encouraged to plant seeds and make themselves independent. They would then share what they could, with others. I think whether there is a war or not, everyone can have a victory garden, even if it is a bean plant in a pot on the front porch. Declare it victory over financial burdens and poverty, victory over helplessness, or victory over going to the store for every bite you eat, and independence from having to spend your entire income on food. -You do need to pay your monthly house rent or payment. Therefore, it will be necessary to eliminate the above "do-not-needs" in order to protect the money for that payment. - You do need your electricity. There are many ways of cutting back on it so that rooms are not left with lights or fans on, and things are not left running all day long. - You do need your water. If you don't spend money on unnecessary things, you assure yourself of the availability of money to pay for your household water supply. Sometimes young women who have quit work to be homemakers, do not realize the cost of water and electricity. They have worked in places where it seemed to be all paid for, and did not realize how it could be conserved. If you can look at your electric meter and watch the numbers roll by, you can understand how the things you turn on or plug in can make your energy costs rise. The more you spend on things you "want," the more likely you are to lose the things you need: light, water, rent, fuel. Keep these at the top of your list as priorities, and you will be able to find many substitutes for other things. -Learn the many uses of age-old, basic, natural ingredients like vinegar, olive oil, hydrogen peroxide, Epsom salts (I think I read somewhere that this was good for the garden)soda bicarbonate, corn starch and many other common kitchen items. You will not have to spend on expensive medicines and cleaners. I can tell you from living both ways--both well off and poorer, that I enjoyed the creativity of the frugal times much better. I quite liked my fringed muslin curtains, and didn't miss the expensive drapery and the accompanying complicated hardware. I enjoyed stenciling the walls and didn't miss expensive wall paper that was hard to remove and couldn't be painted over. I liked doing without a car. It gave me hours and hours of freedom to complete jobs and to cook dinner early and have it ready by evening. I was not rushed. Using a car in the daytime is nice, but it takes a huge chunk of time and can leave a nervous, anxious feeling similar to that of rushing to work and back home. When I didn't have fabric to sew, I enjoyed looking around for unused sheets, table cloths and other fabrics in the house that I could dye, cut and sew for other things. I liked framing scenic pictures from magazines and using them for pictures in the house. 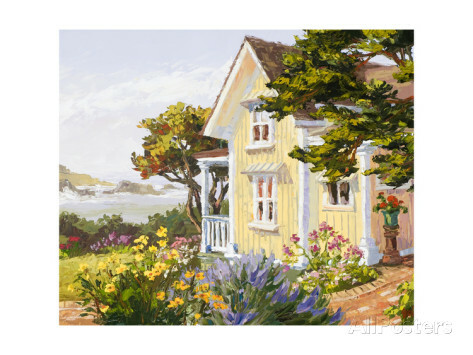 A smaller house was easier to take care of an cost less to paint and decorate. It was cheaper to heat. I could hear everything around me. There were many advantages to living a more frugal life. Being frugal does not mean your house will be unlovely. With the same fabric you make your curtains, you can make a matching tablecloth and napkins and a few runners and doilies, edged in fringe, for other pieces of furniture. You can often coordinate everything much better than if if you were looking for something in a store. Being frugal means you won't have as much clutter and junk as you would if you went to the stores more often. Your house can actually look better. Being frugal means you can make gifts and give them from the heart. It means you will be less wasteful and more mindful of the hard earned money that could be saved. Daughters at home need to learn how to make do without spending. Even if they are going to have money to spend, there is something sad about not having the inner resources to survive if needed. They need to be able to, if necessary, do without, make things do, or create something out of practically nothing. It uses the creative skills and gives them more interest in life. I observed girls who had grown up in families where everything was provided for them. They never had a moment's concern about money or about making things do. When these girls got married, they were bored and unhappy. They seemed to have no challenges or goals. I believe frugality is something that the Proverbs 31 woman had in mind when she "looketh well to the ways of her household." She might have been watching for unnecessary waste. Frugality is actually quite fun, for you can start laughing at the world and its insistence that you need to buy everything. It isn't' true. We can get along with merely a shelter and food and adequate clothing to cover our bodies. If we get extremely poor, we can sell our out-grown, torn, faded, threadbare clothes at a high price to famous actresses and call them "Designer Threads." The Bible instructs women to "guard the home*Volumes of books could probably be written about this subject. All the teaching materials of the past and the present would still not cover all the facets of guarding the home, but I will cover just a few things here. It comes down to the fact that you cannot guard and guide the home if you aren't there. I'm not saying you stay "locked up," in the house, as many would believe, but that your major concern is the care of that place where the family dwells together. Houses left empty of people all day will not have the same loving atmosphere as houses where there has been life and learning taking place. You can sense something in a house where people have been content. You can also sense something missing in a place that has not been occupied during the day. That sense is often created by evidence. An unoccupied home will lack the care and the touches that require quiet thought and steady attention. 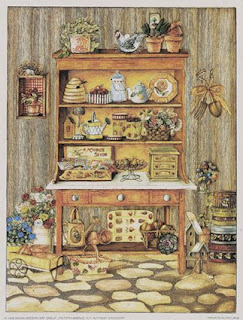 An occupied home will show the things that someone has been doing during the day: a glass of fresh flowers, a porch neatly arranged, and a fresh soup on the stove. These can surely be done by the working woman, but not at leisure, with as much time to spare. A home is miniature nation. Just as a country has to have borders that are protected, the home has to be protected against things that would tear it down and cause it to lose its distinction. The family begins with a married couple and is extended with children. This can vary, of course, depending on the circumstances, but in general, it is good to try to get as close to the Biblical model of the home as we can. When Ruth, the Moabitess was with her mother-in-law, Naomi, that was the only family they had: a daughter-in-law living with her mother-in-law. All the husbands had died and the nearest relative was a distant one. There, two non-related women lived together because they were at one time related by marriage. Both husbands being gone, the two were still knit together because of their common values. Their family situation changed once Ruth married Boaz and had a child. The family then consisted of husband, wife, child and grandmother. There will always be variations of the family, but in general, it is people who are related to each other. 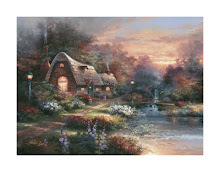 There will of course, be strangers sometimes in a home, but it must be guarded against the interference of people who just "love" your home and family and want to "soak up" the atmosphere. Their presence could be intimidating, and time-consuming. We have to guard against too much interaction with others in the home. The best way to do that is to have deliberate, prescribed times that you plan, in which you embrace the Christian concept of hospitality for a time. When the hours that you devote to that is over, the guests can go home. If you have small children in the home, company can be a trial to their behavior and to their rest time. If you are just married, company can be wearing on your marriage. Guard against interference. Even if a home consists of a mother and children, it is her own domain, where there is privacy from the invasion of other people and their beliefs, and where they are free to develop their own personalities and increase their faith. As a nation should be protected by borders, so a home is protected by its own borders. In this article I will try to explain some of the reasons a homemaker will have to guard her home. Guard the home against inside invasion : You have the doors locked and you have turned away the pesky neighbor children who want your children to come out and play, but are you being careful about the kind of influence that may be invading your home from the inside? Televisions broadcast anything but the idea of parents being the ultimate caregivers and authority over children. Children (and parents), husbands and wives, can get different ideas from media, and they may not even realize how much it is influencing them. Guard the home by selecting only the very best media for your family. Your home library should consist of books and magazines that are uplifting and promote the love and beauty of the home and honor of parents. There are great science videos and enriching stories and lessons that you can obtain for your video library. Even these have to be carefully perused for soundness and faith. Make sure all books and publications are beautiful and worth having for generations. Guard against outside invasion: There are always those who will want to visit, and it is a great opportunity to show Christian hospitality. Know when your friends are invading your time and interfering with your family and have the courage to put a stop to it. Guard the home against economic failure: Advertisements and the influence of friends can persuade us that we should buy this or that, but it is possible to protect your family income from economic invasion. Just use any bonus you get to pay a bill and get yourself free from financial burdens. Instead of buying something new, dig a little deeper inside your house and find old things and use them up. Use up all the paper in your scrapbook collection. Use up all the fabric in your stash. Use up all the pens and pencils. Wear out all your shoes. Wear out clothes. Wear out appliances and then do not replace the small ones unless there is enough money. If you think of a product or a service that you are paying for, think, "How can I do it myself?" You will find there are many things you don't have to pay for, and you can protect the money coming into your home; protect it from going out again. Sometimes just learning to turn off things that run up bills, can reduce your expenses. If you raise your children not to desire the world's goods, you will save yourselves a big expense. New clothes, shoes, entertainment, and vehicles can really strain the family economy. Instead of creating an expense, teach your children how to create an income. Women at home are commonly referred to as "homemakers." The Bible uses the words "guide the home," and "guard the home." The woman has a role at home that goes beyond homemaking. 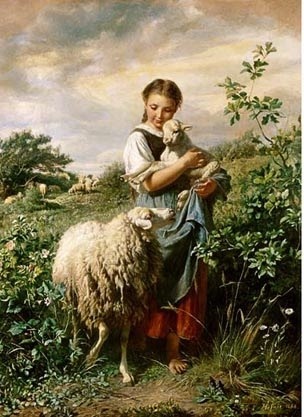 In one verse, young women are told to "marry, bear children, and guide the home,"* yet a huge population of young women are being guided through school systems that will take them further away from their natural role where they can develop many different talents and intellectual skills. If a girl spends a lot on her education, she will not likely give up her career to stay home and take care of her husband or children. She will not want to give up that degree that she worked so hard for. The proponents of the feminist movement know this and are forever urging women to pursue careers. One of the arguments they give is that home making will "stagnate" their brains, or make their minds go into atrophy. Young women are often afraid they are going to be "confined" to the house, where they will be bored, if they marry and keep house. 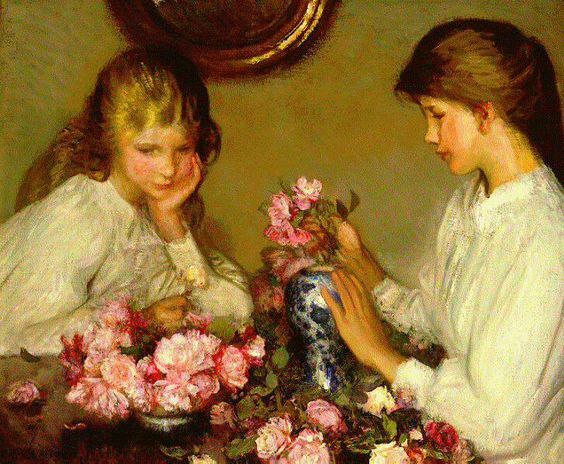 William Kay Blacklock, a painter in oil and watercolor of genre scenes and landscapes, was born in Sunderland in 1872. He studied at the School of Art in Edinburgh and the Royal College of Art in London. 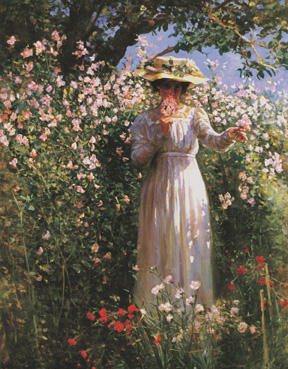 He exhibited works at the Royal Academy, the Royal Institute of Watercolor Painters and the Royal Scottish Academy. Examples of his works are in many leading collections including the Walker Art Gallery, Liverpool. The home is the perfect career for a woman. It is here that she owns the things around her, many of them gifts from loved ones. It is here that she creates a routine based on the needs of her family. Here, also, she is free to enhance the beauty and comfort of the dwelling, according to her own desires. No one can hold her back from career advancement, for she can learn new things and implement them whenever she likes. She can find ways of saving money and still live richly, but a career at home has rewards beyond money. During her tenure as a homemaker, she develops untold amounts of skills and talents. Resourcefulness and creativity are more likely to develop during uninterrupted days at home. One of the greatest motivations of being a good homemaker is being able to experience the results. It is very uplifting to the emotions to have a clean house that has a feeling of joy and beauty in it. Sometimes little corners that have been arranged with love and care, become the focus of photography or art, such as these paintings by Susan Rios. I have sought many paintings from the online art stores and have yet to see very many paintings glorifying women in factories, offices, institutions or other places of work outside the home. 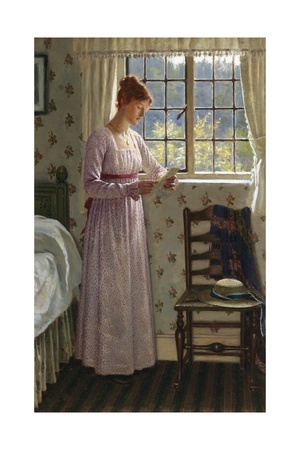 The 19th century paintings nearly always portray women doing something of a serious and peaceful nature at home. When the mistress of the house confidently assumes her role, home life gets better and better. She provides for the family a safe and lovely place to dwell. She makes the house look good, feel comfortable, and smell sweet. She learns all the ways of her home, and from that, figures out how to remedy problems and rise to certain challenges. She looks around her to see things that need to be done. She does things without waiting for someone to tell her. She needs no supervisor. By instinct, the ant and the spider industriously make and provide for their homes. By instinct, women can manage her home. Married women and daughters at home do not require a committee, a study, a group, a march, placards, or an act of Congress in order to be liberated. It just takes one woman at a time taking up her God-given role in the home. It doesn't take a lot of noise or slogans or any kind of a "women's studies" class to convince the next generation that a woman functions best as queen of her home. What it takes is persistant attention to the tasks at home, discerning the most urgent to the least important. It takes women who are willing to live the role of homemaker. Standing around arguing with friends about the viability of such an occupation will not prove a thing. Doing it will. When you come home, life will be more exciting and fulfilling if you will determine to do it excellently, not half-heartedly. You will have sick days, for sure, and there will be times when you need more rest. There will be interruptions and emergencies, but at least you will be there to tend to them. Though she keeps an eye on the time, a woman at home will not be in any particular hurry. This is a great advantage to her health and her mental state. Being at home gives her a chance to think deeply about what is important. Though she is the social director of the home, keeping track of appointments and expected company, she has the power to curtail that side of her life just because she feels the need to. She is not obligated to let the public into her life, yet she can chose the people she wants to associate with. She is not obligated to keep the same hours as the rest of the world, but she is free to make a schedule for herself if she sees the need. That is perfect freedom. I realize there are women whose husbands are gone during the brightest parts of the day and it can get lonely. 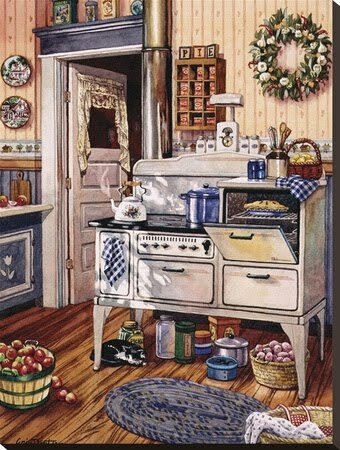 I've always drawn great comfort from the women of the past who kept so busy at home. Nearly all of them could make something with their own hands. 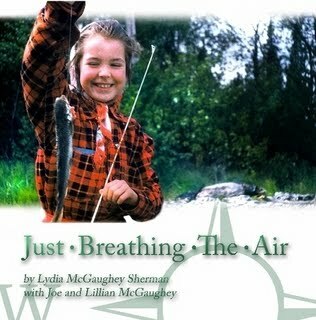 They had an absorbing interest in life. I think this is important for all women to know, so that they can be content when there is no one to talk to. Most of the time, when a man does come home after being around people all day, he just wants to relax and not talk much, any way. That is why having some interests in life that can be pursued from the home, are such a great advantage. Being home is like owning a little world of one's own. Inside that world, there is freedom from all the things that oppress us in the rest of the world. Here there is freedom, but from that freedom, a woman at home can influence the world in a great way. The freedom to rest when needed. The freedom to create without the rules and regulations of the employment place. Freedom to develop family ways and humor distinct and apart from everyone else. Freedom to sing aloud, laugh, and talk about important issues with the family, without censure. The freedom to take sick days without losing your job. The freedom to conduct your day according to your personal needs. The freedom to dress as you really want to, without the dictates of current fashion. Freedom to learn new talents and skills and do with them as you like--keep, give away, or sell at your own price. When you are home-based, you need not compete with the traffic of the working world, and you don't have to fill your gas tank so often. 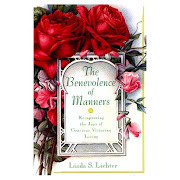 Anyone interested in the theory of decorating in the 1920's can go here http://www.1920-30.com/interior-decorating/ and click on the link that takes you to a free book written in the 20's. Does both the husband and wife working for a wage ensure a strong marriage and a good family? You would think so, according to the figures regularly produced by financial statistics. For decades, those who wish for women to be in the workforce, have claimed that a family "cannot make it" on the husband's income. Now they say the family cannot make it on "one" income. I remember when this was announced. It was shortly after I was married, and I was astounded. How is it that a whole generation of women in the 1940's, having no car of their own and few worldly comforts, still managed to stay home, with or without children, and manage the home for their husbands? How is it that my own mother, grandmother and great-grandmother found so much to do, even in poverty, at home, that they would not have dreamed of leaving the task to someone else to go outside and earn money? How is it that raising their children was such an enormous responsibility that they wanted to do it entirely themselves, money or not? * "Afford" is defined by other people. If you define it yourself, you can do without most everything the commercial world beckons you to have. Even if you had to reduce your comforts as drastically as going without a car, you will still, somehow be looked after. I know family members who team up whenever they need to make an essential shopping trip, using only one vehicle. Others have found a way to share the cost of a home, selling it later and dividing up the profits for their own homes. Young girls are opting to stay home with their parents until marriage, in order to avoid the high cost of apartment living. * "Needs" are also defined by everyone else, particularly those who want to keep the women in the workforce, away from home. It is time to finish the Wives and Daughter's review. At this point I would also like to mention that the men in our family adore the video series and appreciate it almost more than the women. At present there are 6 males and 3 females here that watch it, and I can safely say the men never fail to stop and watch when we are viewing it, and comment on how brilliantly the story was created and how perfectly it was put together on film; how carefully the actors were chosen and how well they perform their roles! So far, Molly has adjusted to many changes in her otherwise placid life: the illness and death of Osbourne, Roger's brother, and the appearance of his wife and child at Hamley Hall. Roger has been ill during his stay in Africa, which deeply troubles Molly. Cynthia, ever on the look-out for new admirers, has had yet another proposal, from Mr. Henderson, whom she met when she went on the trip with her mother to visit relatives. "It wouldn't hurt to be a little more forthcoming," advises Molly's stepmother, Hyacinth. "It certainly didn't do Cynthia any harm." 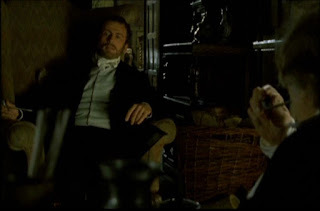 "I'll try and talk about something more agreeable....old Margery at the lodge is dead!" When Roger arrives home from Africa, "brown as a berry and sporting a fine growth of a beard," his father says to him, "Neither one of you settled your fancies on little Molly Gibson. Now there's a lass that has found a way to my heart!" "Molly's like a sister to me," claims Roger. Roger and his father embrace, both desperately grieved over the death of Osbourne. Osbourne's widow and child look on. "What lovely flowers!" exclaims Molly. They were sent by Roger, who is back from Africa. I wish there had been a longer view of this bouquet. It looked like some of the old paintings. At the dinner honoring Roger, Molly says, "Papa said you had a beard!" "My father told me you were like a true daughter to him when Mamma died." Osbourne's widow and Molly stroll on the grounds at Hamley Hall. She tells Aimee that she and Roger are "like brother and sister." "No," replies the French woman. "I don't think so." 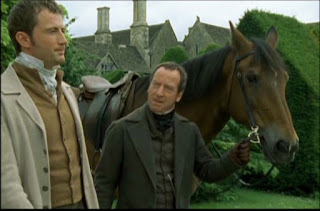 The Squire, Roger's widowed father urges him to "try again" and ask Molly to accept him. He insists that eventually Molly will say "yes." Roger still intends to go back to Africa, after the funeral of his brother. Mr. Gibson says, "Give me a man of science in love: no one to beat him for folly." (You might be smart in science, kiddo, but you have no clue about love!) Mr. Gibson may have been wondering why, at this time when Roger finally admits he loves his daughter, he chooses to leave on a trip. Roger asks Molly's father if he thinks Molly could bring herself to accept him. "I don't know," said Dr. Gibson. "Women are queer creatures, and just as likely to accept a man who has been throwing his affections away, but if she can stomach you, so can I." Roger proposes to Molly in the rain. "I couldn't go," he said, and then, "Molly, dearest Molly! Will you be my wife?" "Yes. Yes, I will!" Roger can't believe he heard right. "I've been such a fool!" he confesses. "I can't come any closer. I promised your father." Mrs. Goodenough comments that she expected Molly to dress a bit grander since she became mistress of Hamley Hall. Phoebe Browning replies, "Our Molly looks good in anything she wears," and then goes on to say she always knew Roger loved Molly. "He gave her a wasps nest once for a present, and you don't do that for just anyone!" Lord Cumner congratulates Roger on his marriage to Molly. Hyacinth reflects on Cynthia's good fortune in marriage, but says, "Riches are a great snare, you know." Dr. Gibson replies wryly, "Be thankful you were spared temptation." Just married, Molly accompanies Roger to Africa, a country he is fascinated with. 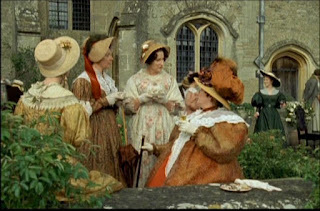 I found all the scenes just wonderful, but this one made me question whether or not that outfit would have been worn during Elizabeth's Gaskell's time. Even on safari, women wore special travelling clothes, that may have included the split skirt. This looks like a pair of women's riding breeches on Molly, and I'm not prepared to say whether or not that is historically accurate. I am sure there are real photographs of the times and the places of the adventurous Victorians, which reveal the kinds of clothes women wore to places like Africa. 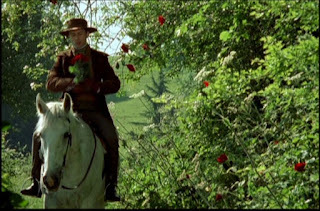 Roger picks wild roses on the way to Molly's house to announce his new commission to Africa to participate in exploration and study. 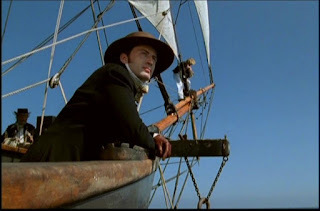 The men in my family particularly enjoy this shot of Roger on the ship to Africa. "Just don't let it happen again," Mr. Gibson tells Cynthia, after she encouraged the attentions of Mr. Cox, who proposed, and was turned down. Cynthia tells Molly her woes: she is engaged to Robert Preston, and also Roger Hamley. Molly doesn't approve, of course. "Cynthia, how could you have gone and engaged yourself to Roger?" she asks. 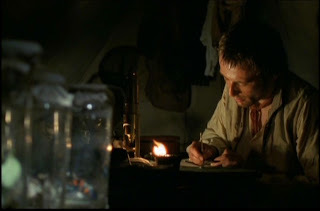 Inside his tent in Africa, the scientist, Roger, writes to "dearest Cynthia"
I wonder if the creators of these period movies realize how important the props are, to the audience. Even the tea cups have to be authentic. Every fan of the era would be up in arms if even the china or furniture looked like a piece from the wrong period of time. This tea cup will be carefully examined by W & D people, and the web will be scanned for replicas of it. 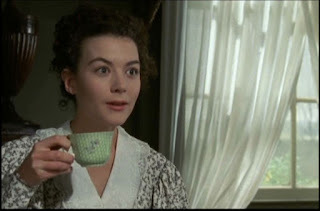 Mr. Gibson's new wife, and new stepmother says, "I have that deep feeling about duty, that it ought to be spoken of in church, and sacred places like that, not in someone's sitting room, with everyone drinking tea!" Lady Cumnor has just chastised Hyacinth for being derelict in her duty to train up her daughter to behave properly toward men." Molly and her new step-sister, Cynthia, share Cynthia's exhuberant joy at being allowed to go to London to see her relatives. "Papa, how could you waste one of our evenings? 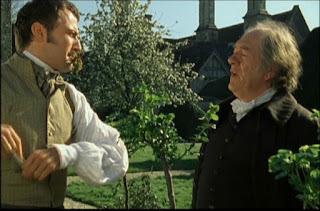 We have but six evenings altogether, and I reckoned on us doing all sorts of things!" While Cynthia and her mother are in London, Molly once again has her father to herself. "Oh, I don't know. Everything that is unrefined, and ungenteel." "By toil and labor, I've reached a fair height of refinement, and I wont be pulled down now!" "Oh yes, just for a week you will!" 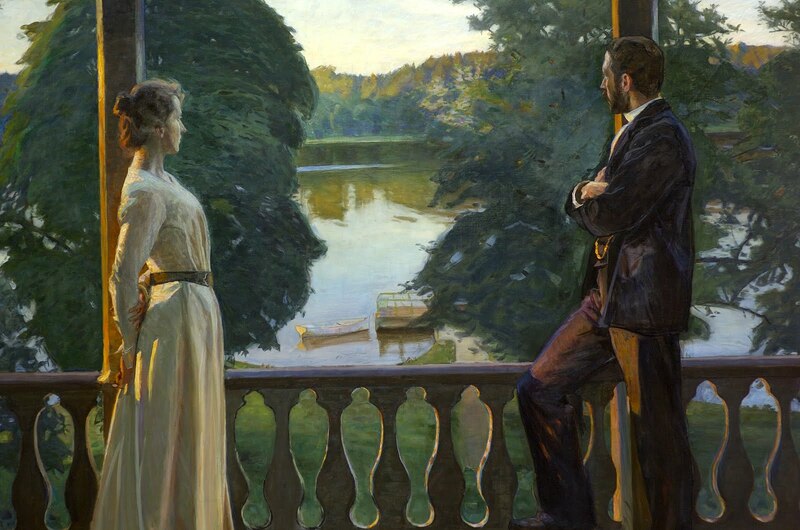 "We'll have bread and cheese for dinner and eat it on our knees..."
"I used to bring your mother here," Mr. Gibson tells his daughter, Molly, as they sit and enjoy the scenery. Part 3 ends with the scene of Molly standing in the woods with the beautiful meadows in the background. She has just helped to break off Cynthia's engagement to Mr. Preston. There are several other side issues going on in this story: The Hamley family, the Browning sisters, The family at The Towers, Dr. Gibson's work and the people he visits, Mrs. Goodenough and The Duchess (that ill-mannered woman that kept them all waiting and then showed up looking more like a commoner. 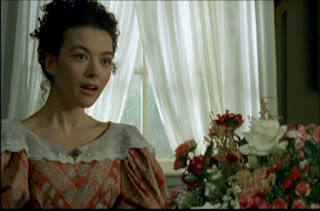 It was a great disappointment to Mrs. Goodenough, who said, "I thought she would at least come in her jewels or coronet." 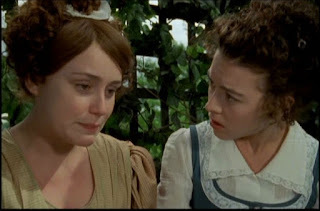 I've always thought young girls ought to read Wives and Daughters because of the great contrast of the character of Cynthia and the character of Molly. Cynthia seems to be a little more upper-crust than Molly, yet she isn't very sensible. 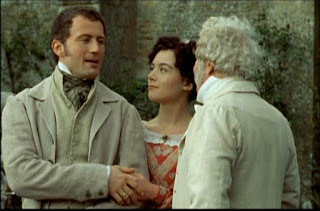 Molly is a doctor's daughter, who was not a rich person in those days, but she has a strong sense of duty. Cynthia is foolish and downright silly, and creates problems wherever she lives. Some young women might watch the film version with naivity, thinking Cynthia is "pretty neat," because she has more fun than Molly. Cynthia only wants to be liked. She craves attention and when she gets tired of one person, she flirts with someone else, only to let them down after awhile. She wears flashy clothes and outrageous hair styles. She only wants to be happy. Molly, on the other hand, knows that happiness only comes from standing by the principles she was taught, even if it means you might miss out on some fun. We have to carefully guide the young girls to mature beyond the shallow behavior exemplified by Cynthia. Of course, Cynthia was raised without the authority and love of a father, and her mother left her in the care of others while she went to work as a governness. Cynthia admitted to not having a good relationship with her mother, and said,"If Mamma had wanted me to love her, she shouldn't have sent me away to school at four years old." 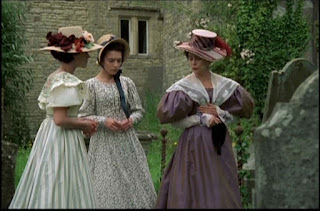 Wives and Daughters by Elizabeth Gaskell part 2, continued. So far, we have seen the sweet character of both Molly and her young friend, Roger Hamley. In contrast, her new stepsister, Cynthia wants to have secrets and weaves a tangled web of insincerity regarding her relationships with people. Interestingly, Roger's brother also keeps secrets of great consequences from his father. The fact that he is married and is expecting a child, is kept from his father because his father hates the French. "I remember once Madam wanted a French maid. I'd sooner keep snakes in the house!" "In my day," he said, "We were content to hate the French. Aye, and beat them at sea and on the land!" Osbourne married a French woman while he was abroad, and never told his father. It strains their relationship and takes its toll on Osbourne's health. He shares the secret with Molly so that someone will know of his wife, Aimee's whereabouts and be able to help her, in case anything happens to him. Now Molly is having to keep a secret, even from her father. She doesn't like doing it, but she made a promise not to reveal anything to anyone. Her step-sister also has a secret: she tells Molly she is secretly engaged to Mr. Preston. Once again, Molly has to agree to secrecy. "I do so hate these underhanded dealings!" she tells Cynthia, when Cynthia wants to involve her. Hopefully, the reader comes to admire Molly and want the best for her. One cannot help thinking, at this stage of the story, that Molly must wish for her old life back, when things were simple, and the only one she had to please and give comfort to, was her father. "I think you must be a very good person, Molly," Cynthia tells her. "I am not very good, myself. In fact I gave myself up as a heartless baggage, years ago." They both fall into laughter. Molly happily picking berries in her apron before she arrives home to learn the startling news. Blueberries staining her hands and her apron, Molly mourns the loss of Roger as her best friend, now engaged to her step-sister, Cynthia. Roger tells Molly, "A man needs the companionship of a woman." Here's the picture of Roger trying to console Molly when she fell apart emotionally after the news that her father was going to marry. "It doesn't do any good," he said, "to pre-judge people. It will all work out for the best." 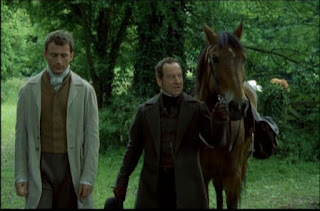 In the previous episodes (based on the reading of the book which I obtained free online, and the set of 4 movie episodes), Molly, a motherless girl, gained a new Mama, a new friend in Mrs. Hamley, plus her husband, Squire Hamley and their two very nice sons, Osbourne and Roger. Later she gains a stepsister. Her losses began with the loss of her mother, then she, through her father's marriage, loses her place in his life (or so she thinks) and her mother's things, which are removed by the new Mrs. Gibson. In episode 2, Molly meets her new step-sister, a social butterfly named Cynthia, who enjoys capturing the attention of any young man around, even allowing herself to be engaged, sometimes to more than one person at a time. Molly does not seem to be influenced by this but is often saddened at the way Cynthia wins people's hearts and then lets them down. Mr. Gibson doesn't like foolishness at all, and he lectures Cynthia about her ways. Mrs. Hamley, whom Molly has grown to love as a mother, dies, adding another loss. Yet through this she gains the love and respect of all the Hamley family. Roger tells her "I think of you as a sister." 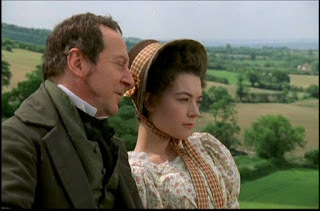 These are just a few quotes and scenes from the first video of Wives and Daughters, by Elizabeth Gaskell (1810-1865). Our family has had frequent discussions about Molly and the other characters in the story. We also enjoy listening to a free download of the story online. My favorite character is Mr. Gibson, as an ideal father. He is the country doctor. Molly has an idyllic life, even though her mother died, because she loves her father so much and she trusts him completely with her future. Mr. Gibson says "Her happiness means more to me than anything." She's a "good girl, who is always ready to do what anyone asks of her," as Mr. Hamley, a family friend, says. Although Molly really is a good girl, and has already lost her mother, she begins to suffer losses, one right after the other. Shortly after the story begins, her father sends her to stay with the Hamleys, a family Mr. Gibson likes, who has two sons. Obviously he hopes she will become interested in one of them. She says, "I was never away without you, Papa." She is thrust into the home of another family, a family that has conflicts and sorrows. After that, her father decides to remarry. The revelation sends her into a state of grief. "I never thought he would want to marry again. He had me," she told Roger. "You don't know what we were to each other!" Later, her new mother decides to redecorate her room, and disposes of all the old furniture and things in it. Here is another loss. Molly faces one loss after another in her comfortable life, yet she will eventually have more than enough, emotionally and materially. The opening scene is a favorite of children in my house: Molly watches a caterpillar. As she grows up, this scene becomes more significant, in connection with someone else in her life. Nearly 10 years old, Molly falls asleep near a huge tree at The Towers where she was invited to a garden party for children. Near the end of the story, the grown-up Molly finds solace at the roots of that great tree, once again. Every frame of this movie could be a painting. Here, Molly sits above the barn, with a view down the road toward the village. "She really is the loveliest girl! Do you think I have a chance with her?" 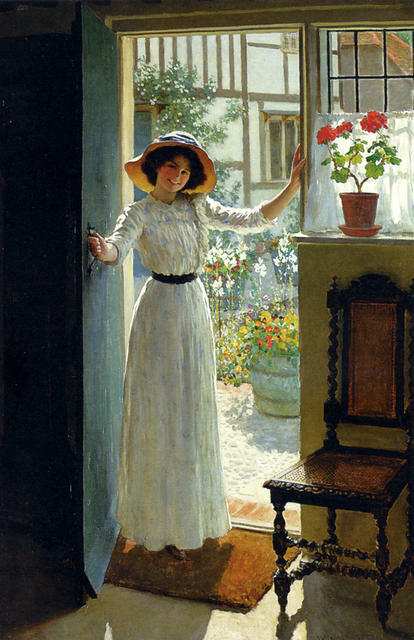 Mr. Cox, one of the doctor's apprentices, watches Molly walking outside, from the doctor's surgery. "This is a motherless girl of barely 17, and that is not what you are here for." 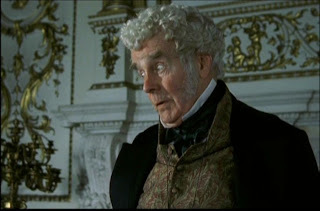 Mr. Gibson then ships Mr. Cox, one of the apprentices in his practice, off the premises almost immediately upon discovering that he has written a love note without his permission, to his daughter, Molly. ...and prepares to ship Molly off to the Hamly's at "Hamly House," to become acquainted with his two favorite young men, Roger and Osbourne Hamley. "I was never away without you," she says, feeling puzzled. This is my favorite picture of Roger, for it looks like a scene from the 19th century; a painting, if you will. 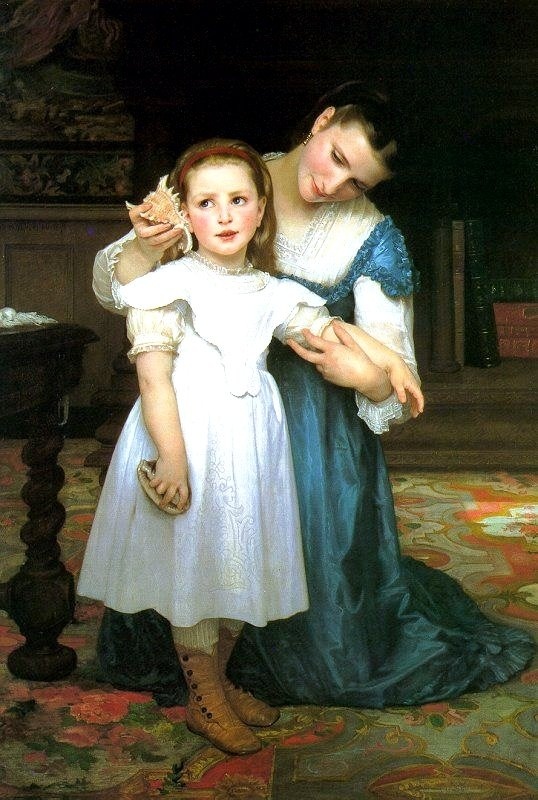 "I am sure you have thought, as I have, the difficulties of being a young woman growing up without a mother..." Molly interrupts: "You're going to be married again." Lady Harriet advises Molly to "be a good girl and suffer yourself to be led, and you'll find your new Mama the sweetest person." 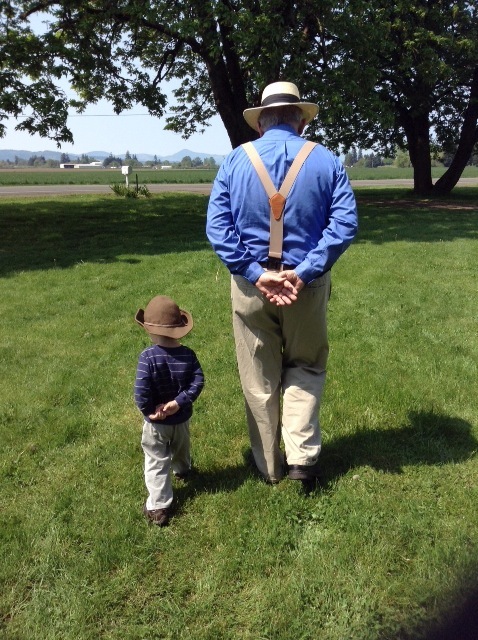 "Try to walk half a mile a day," instructed Dr. Gibson. "Such a pleasure being told what to do, for a change," said Lady Cumner. I like this lemon chiffon colored dress with the white lace collar, and the sage green shawl. Here, the Miss Brownings tell Molly that Roger came by and left a hornet's nest as a gift for her. "I wouldn't touch the horrid thing! Either you or he or both of you must be crazy." "What have you done with my things? They were my mother's!" I did not make exact quotes in some cases but you can get the idea. Please add yours from Volume One only. I couldn't find pictures for some of my favorite scenes, one being Roger and Molly walking home to lunch while he tries to console her sadness at prospect of her father remarrying.